Number of the week: Can a person make a fortune by honest means in Russia? 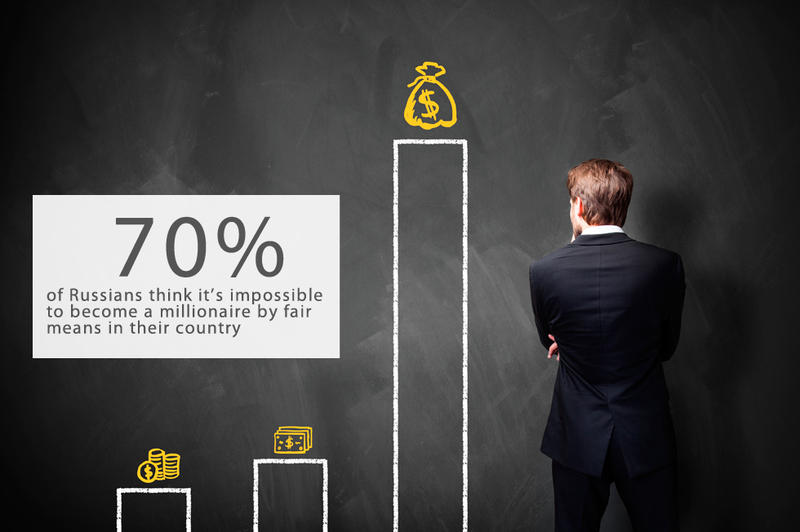 70 percent of Russians think it’s impossible to become a millionaire by fair means in their country, according to a report from the Levada Center pollster. The figure is lower than in 2006 (then it reached 83 percent) but unchanged since 2008.According to the new poll, almost 33 percent of correspondents believe that financial inequality is dangerous. 60 percent of Russians see inequality as permissible so long as the gap is not significant.The poll was carried out in June 2015 and is based on answers given by 1,600 people in 134 locations around Russia.Photo by Shutterstock. 70 percent of Russians think it’s impossible to become a millionaire by fair means in their country, according to a report from the Levada Center pollster. The figure is lower than in 2006 (then it reached 83 percent) but unchanged since 2008. According to the new poll, almost 33 percent of correspondents believe that financial inequality is dangerous. 60 percent of Russians see inequality as permissible so long as the gap is not significant. The poll was carried out in June 2015 and is based on answers given by 1,600 people in 134 locations around Russia.